Answer: That’s the big question that many cosmologists are trying to answer. By definition, the universe is all that exists, so any measure of that size will necessarily push our observing technology to its limit. The farthest we have seen into space is about 18 billion light years. By “seen” we mean imaged by special telescopes that can detect faint infrared (heat) radiation. We can’t see that far with our limited human eyes. Remember that when we express a distance in light years we are using the speed of light as a gauge of distance. It would take light (which is very fast) one year to travel a distance of one light year. 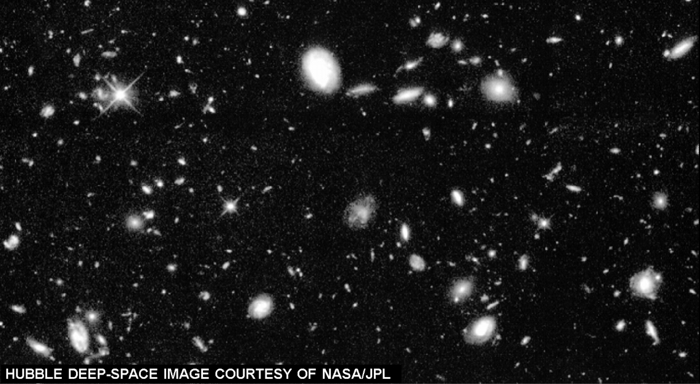 Now here’s the tricky part … the universe was born about 18 billion years ago. And since the speed of light is 1 light year per year, if there are any objects farther out, their light hasn’t yet had enough time to reach us. Another way of looking at this is: as the universe ages we get to see more of it.